9:30 - 10:30 AM: Plenary Speaker: Douglas Wolk, "Romance With Borders"
2:00 - 3:30 PM: Panel Discussion: Contemporary Russian Comics. With Dmitry Yakovlev. 4:00 - 5:30 PM: Roundtable: On the Theory and Practice of Comics Pedagogy. With Brian Michael Bendis, Diana Schutz, and affiliated teaching faculty within the UO Minor in Comics and Cartoon Studies. Moderated by Ben Saunders. 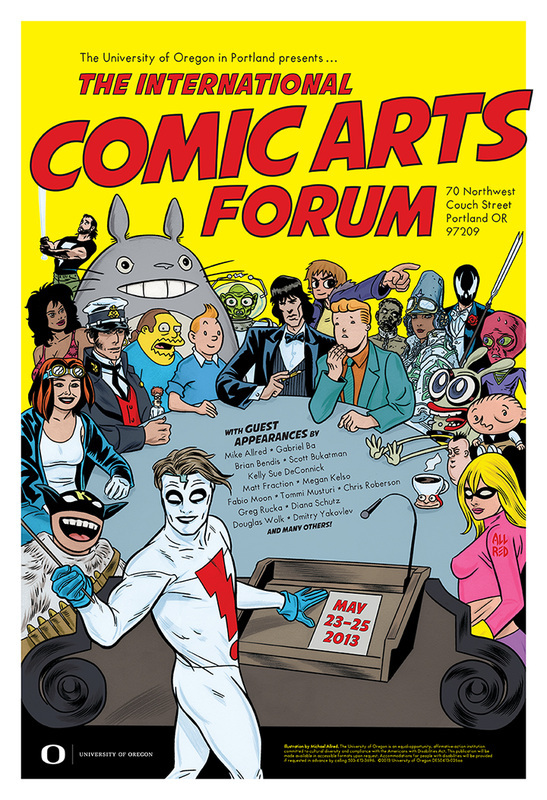 2:00 - 3:15PM: Roundtable: Beyond Auteurism - Creativity and Collaboration in Comics. With Gabriel Ba, Kelly Sue DeConnick, Matt Fraction, Charles Hatfield, Ben Saunders, Qiana Whitted. 3:30 - 4:30 PM: The John Lent Award Lecture: "How to Think About Comics as Social Objects,"
Benjamin Woo, Simon Fraser University’s Centre for Policy Studies on Culture and Communities. Abstract: Comics can be defined in many ways. They are art works that create aesthetic experiences for their readers, cultural objects reflecting the time and place where they are produced, and commodities with a value on the market. But they are also social objects. They are made, read, and talked about by people who exist in a relatively stable set of institutions and relationships. This lecture addresses some of the possibilities and problems of a social-scientific approach to comics, placing them in the context not only of the “comics world” but also of a wider social world of geeks, nerds, and fans. 4:30 - 5:30 PM: Documentary Film Screening: "Comic Book City: Portland, OR"
7:30 PM - 9:00 PM: An Evening With Gabriel Ba and Fabio Moon. Moderated by Matt Fraction. Josina Robb, "The Spatiality of Voice: How Joe Sacco’s Palestine Takes Up the Ethos of New Journalism." 2:00 - 3:30 PM: Roundtable: Comics and the Pacific Northwest. With comics creators Megan Kelso, Greg Rucka, and T. Edward Bak. Moderated by Ben Saunders. 3:30 PM: Coffee Break with Documentary Film, "The Comic King of Guatemala"
Small scheduling adjustments are sometimes necessary. Please check in before the event to catch any last minute updates. The ICAF conference welcomes interested members of the public - but please note that any beverages and snack foods supplied on the premises are for speakers and panel participants only. Panel participants and speakers should further note that lunch and dinner will not be supplied. However, the UO in Portland building is conveniently located with access to several restaurants and diners within short walking distance.